Widened six miles of the I-215 between Murrieta Hot Springs Road to Scott Road by adding one general purpose lane in each direction. 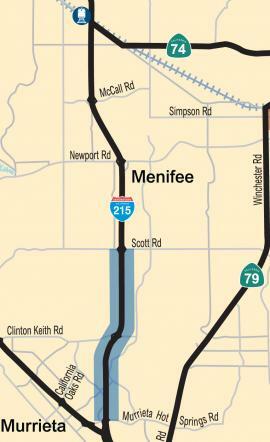 New lanes opened in September 2012 on a six-mile section of I-215 from Murrieta Hot Springs Road in Murrieta to Scott Road in Menifee. One lane and a shoulder were added within the existing freeway median, creating three northbound lanes and three southbound lanes. This project also widened the Keller Road Undercrossing, added a median barrier, repaired existing pavement and adjusted freeway grading and drainage.